I think the best people in the world are probably the ones whose names you never hear. These are the people who live and serve like Jesus did. He wasn’t in big cities all the time, didn’t write any books, made no headlines, networked with no one important. He was with fishermen and no-counts, prostitutes and sinners. Why am I reflecting on these realities this morning? Because of the little glimpse I had into how hard the dedicated Communications team at Southern Seminary worked to bring out God and the Gay Christian? A Response to Matthew Vines. I’m not aware of all the details, but they had a very short turnaround time to meet the deadline of having that project ready to go when the Vines book released last night at 3am. They worked nearly until that time, some of them having started almost 24 hours earlier. While the rest of the world was watching the NBA Playoffs or sleeping, this team was re-reading, editing, fixing, and fussing over that last detail. They left it all on the court. So if you are helped by this book that Heath Lambert, Owen Strachan, Denny Burk, myself, and Dr. Mohler wrote the words of, let me encourage you to thank God and pray for the people who made sure those words were grammatical, made sure the references were right, made sure the cover looks sharp, and did a thousand other things that we would never imagine such a project would entail. I give praise and thanks to God for the quiet, behind the scenes work of Jim Smith, Steve Watters, Aaron Hanbury, Eric Jimenez, RuthAnne Irvin, Matt Damico, Jason Thacker, Jason Coobs, and I probably haven’t gotten them all. Unsung heroes. Thank you guys. I’m praising God for you. If you know these folks, you know they are talented people who each have important stuff going. Know, too, that like their Master, Jesus, they can serve when there won’t be any recognition, when they won’t get so much as a mention on a masthead. But when you see a phrase like “SBTS Press,” know that there are hardworking people making that happen. Pray for them. Thank God for them. Where would we be without them? More than any other book that will be published in 2013, I’m excited to see this new one from Brian Vickers. Having already published on imputation (which if you haven’t read it already, you should click right here and get yourself a copy of Jesus’ Blood and Righteousness), and having spent years doing exegesis, reading widely and deeply, and faithfully teaching students, to say nothing of living well through joy and sorrow, there’s nobody I’d rather read on the article on which the church stands or falls than Brian Vickers. My recommendation is that you pre-order your copy today. 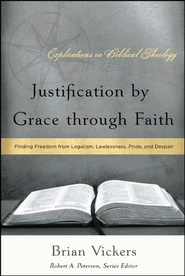 Seriously, can you think of a topic more central to the gospel than justification by faith? Don’t think you’ve got this one in your back pocket. I’ve had the pleasure of many a conversation with Prof. Vickers, and I’m excited about the insights waiting to burst in the minds of the readers of this book. After you pre-order your copy, I recommend you write P&R to thank them for publishing this important book, and ask the Lord to do more than can be asked or imagined with this important new title. Just in case you’re wondering why I would give the warning with which this post began, the problem is that my enthusiasm over this new one from Brian Vickers is approximated by my anticipation of forthcoming volumes by Denny Burk and Tom Schreiner. What hath Whittaker Chambers to do with “Hope and Change”? What hath communism and secular liberalism to do with the promises of God in the Bible? What do racial equality and diversity, environmentalism, peace in our time, provision for all, the hope of socialism, the goals of liberalism, and the aims of all politicians have to do with Christianity? On Sunday, November 20, 2011, it was my privilege to address “Hope and Change and the Promises of God” at Providence Baptist Church in Pasadena, TX. This was an overtly evangelistic, gospel sermon. This was a sermon aimed at unbelievers pleading with them to embrace Christianity. May the Lord be pleased to call many to himself. A vulnerable bride holding fast to a promise. An immoral temptress and her consorts. And the King, coming on a white horse. John writes to small, scattered churches with little worldly influence, urging them to hold fast to the word of God and the testimony of Jesus. Sexual immorality lures them toward destruction. False teaching threatens to undermine their standing before God. An ancient dragon wages war on their souls. But the King is coming on a white horse. Revelation: The Spirit Speaks to the Churches in the Preaching the Word series is now available for pre-order on Amazon. On Sunday, May 22, 2011, it was our pleasure and privilege to ordain Ross Shannon to gospel ministry. Ross has been serving as the Assistant Pastor for Discipleship and Evangelism at Kenwood, and he just graduated from SBTS and was called to serve at First Baptist Church, Lapeer, MI. I had the honor of preaching Ross’s ordination. Ray Van Neste’s recent post on a good shepherd laying down his life for the sheep provided my introduction, and Floyd Doud Shafer’s phenomenal 1961 Christianity Today article inspired the conclusion. We had a number of members of Kenwood graduate from SBTS, and as I was sitting there watching them cross the stage on Friday, reflecting on Ross and some other dear friends moving on to new ministries, I started this poem for Ross’s ordination. Giving God the thanks and praise. Do Flowers Make You Feel Guilty? Have you ever looked at a flower? This week we went down to Bernheim Forest, and we saw this Quiet Garden full of Peonies. Have you ever thought about how delicate, transient, gratiuitous, and useless flowers are? God has lavished his creativity, resources, energy, mental ingenuity, and power on these things that serve no other purpose than to be beautiful. Now think about the fact that there are deserts in the world where no flowers grow. God has made some parts of the world gardens and other parts of the world deserts. My point is not that those who enjoy gardens shouldn’t think about ways to irrigate deserts. We should. My point is that those who live in gardens don’t need to feel guilty about the flowers. We can apply this to God’s spiritual blessings just as well as we can to material ones: Some parts of the world have the word of God (incidentally, those also tend to be the parts of the world where it is possible to have clean water, good medicine, and funds that are safe from thugs and dictators who seize assets). Other parts of the world lack the Bible. Those who live in a land where the Bible is shouldn’t feel guilty about the mercy God has shown us. We should try to get the Bible and the gospel to other lands, but we shouldn’t feel guilty about the goodness God has given to us. Why am I talking about flowers and deserts? Yesterday it was my privilege to preach the first part of Mark 10. I was going to do the whole chapter, but time ran out so I had to do a crash landing in the middle. Anyway, we were right there in that passage where Jesus tells the rich young ruler that he has to sell everything and give to the poor. I bring up this thing about flowers because I think Jesus telling the rich young ruler to sell all and give to the poor has caused a lot of Christians to feel false guilt about about having possessions and putting money in savings. The point about flowers is picking up on what Paul says in 1 Timothy 6, where he tells rich people not to hope in wealth but in God, who richly provides us with everything to enjoy – that is what 1 Timothy 6:17 says – go read it. If God has given you something, he wants you to enjoy it, not feel guilty about it. Don’t reject God’s goodness and mercy to you by refusing to enjoy his gifts. Be generous to others. Preach the gospel. Lay your life down for them like Christ did for you (i.e., live the gospel). And enjoy God’s kindness. But doesn’t the passage about the rich young ruler teach that we shouldn’t enjoy things (not even as God’s gifts) and that we shouldn’t save money? 1) This rich guy is not a believer, so Mark isn’t giving this episode to show Jesus teaching his disciples. Mark is showing Jesus doing evangelism in this instance, not discipleship. 2) Jesus isn’t giving this guy a ladder he can climb to get into heaven. The guy could do what Jesus tells him to and still go to hell–if he continued to trust in his ability to make more money and if he continued to worship Mammon. Jesus is exposing this guy’s idolatry, not giving a recipe to unbelievers. So if you’re not a believer, Jesus is calling you to trust in him, not your money. And he’s trying to help you recognize that you can’t redirect your trust on your own power. It’s a miracle that you need God to do for you. You need God to cause you to be born again. So if there’s something in your life that you don’t know how to overcome—maybe it has to do with the fact that you do love and trust money more than you love God and trust Jesus. Maybe it’s the fact that you’re living in adultery and you can’t overcome it. Jesus wants you to recognize your inability, and he wants you to cry out to him to help your unbelief. 3) Mark 10:30 shows that the issue here is not having possessions, because Jesus says that those who follow him are going to get everything they give up back in this life (with persecutions). So Jesus doesn’t have something against possessions. He’s not advocating poverty or communism or socialism or homelessness. He is advocating the worship of God by faith in him. So I submit that if you read this passage and come away thinking that you need to do something for Jesus in order to enter the kingdom of heaven or be his disciple, you’re missing the point. Do I think Mark is teaching that followers of Jesus are called to sell all they have and give to the poor? Are we called to trust Jesus not Mammon? Are we called to steward what God has given us for the glory of God? Are we called to leverage all we have for the gospel? But divesting yourself of all possessions and of all means is not necessarily good stewardship, nor does it necessarily give you leverage. Go to the ant, O sluggard; consider her ways, and be wise. Without having any chief, officer, or ruler,  she prepares her bread in summer and gathers her food in harvest. As for the rich in this present age, charge them not to be haughty, nor to set their hopes on the uncertainty of riches, but on God, who richly provides us with everything to enjoy. They are to do good, to be rich in good works, to be generous and ready to share,  thus storing up treasure for themselves as a good foundation for the future, so that they may take hold of that which is truly life. Look at those beautiful flowers. Smell their fragrant aromas. And worship God who causes such beauty to continue in this world made ugly by sin. Proposition: The Chinese government is wickedly persecuting Christians and opposing God and his gospel. May God break the teeth of the wicked (Ps 3:7). Question: Did the Shouwang Church need to force this issue? Maybe so. I really don’t know. From the article linked above, it appears that the church could have continued to worship had they been content to do so in smaller numbers in private venues. Thoughts on Paul: On the one hand I can imagine Paul saying that the public confrontation will result in more people hearing the gospel (Phil 1:12–21). On the other hand, there were times when he did not take on the confrontation with the overpowering government, fleeing from King Aretas (2 Cor 11:32–33), and though he wanted to take on the crowd in Ephesus the other believers wouldn’t let him (Acts 19:30). No doubt more information about the situation in China would be helpful. What do you think? Should the Shouwang Church have forced the issue or stayed underground? What a book! Laura Hillenbrand’s Unbroken is a “true tall tale” (AP) powerfully told. Somehow Zamperini survived the war, and though at the time they might not have called it Post Traumatic Stress Disorder, coming home he had it with a vengeance. He met a beautiful girl, and after two weeks had convinced her to marry him. Haunted by nightmares of the vicious cruelty of the Bird, Zamerpini was a drunken disaster. Having a nightmare of the Bird using his belt as a whip and lashing his temple with its buckle, Zamperini attacked the bird and began to throttle him. He woke to find himself on top of his wife with his hands around her throat. He was strangling his pregnant wife. Soon after the baby was born, she decided to file for divorce and left him (367). Then in September of 1949 Billy Graham arrived in Los Angeles (369–70). As Zamperini was making plans to find his way back to Japan to murder the Bird, his wife returned to LA to arrange the divorce. She went to the Graham crusade and believed the gospel (371). She talked Zamperini into going to the crusade the next night, and when Graham gave the invitation, Zamperini marched out furious. Why did he go back the next night? The nightmares and exhaustion caused him to relent under his wife’s coaxing, and at the end of the second night Zamperini trusted Christ. He poured out his alcohol, threw away the girlie magazines and cigarettes, and never had another nightmare about the Bird (376). He began to minister by sharing his testimony (377). He traveled to Sugamo Prison in Japan, where the war criminals who had abused him were now imprisoned. He forgave them (379). Back in California, he opened the Victory Boys Camp for troubled young men. He has carried the Olympic torch at the opening of five Olympic Games (383). You won’t regret reading Unbroken. On Sunday, March 20, 2011, it was my privilege to preach Mark 7:1–37, “To the Jew First and Also the Gentile,” at Kenwood Baptist Church. At the exodus from Egypt Moses led Israel through the Red Sea into the wilderness where they immediately needed water and food. The Lord provided bread from heaven and water from the rock. Then they arrived at Sinai, where the Lord gave Israel his word through Moses. Then Moses taught the people how they were to live to preserve cleanliness and walk with the Lord. In the new exodus Mark is depicting, John the Baptist has prepared the way, Jesus has calmed the sea and walked on it, he has provided bread in the desolate place, healing for the sick, and authoritative teaching. Now in Mark 7 Jesus will issue an authoritative declaration about all foods being clean. Jesus conforms to his own standards and helps people on his own terms, and his standards and terms are holy, righteous, and good. The Pharisees miss the point of the Old Testament and nitpick Jesus’ disciples about handwashings, then Jesus declares that it is what comes from the heart that defiles. After the scribes and Pharisees reject Jesus, he goes to Gentile territory, where Mark shows it’s better to be a dog who gets crumbs than a child who refuses to eat, and then a Gentile has his ears opened and his tongue loosed. Through March 31, 2011, ChristianAudio.com is giving away John Piper’s Jesus: The Only Way to God. If you’re in the area, or if you’re looking to get away for some refreshing time in the word with some co-laborers in the Gospel, it would be a joy to see you April 8–9, 2011 at the 9Marks Regional Workship in Wheeling, West Virginia, at First Baptist Church of Wheeling. Details on the Location, Speakers, and Schedule can be found on the 9Marks site. The only hope for sinners is repentance. The gospel of Jesus Christ is good news. Fighter Verses for your mobile device. Hide it in your heart. Talk of them when you rise up and lie down, when you sit in your house and walk by the way. Don’t waste your life. And don’t waste the childhood of your little ones. “Abandonment, abortion, abuse, addiction, adultery, alcoholism, alienation, anorexia–words hardly understood a few generations ago but now on everyone’s tongue, words we can hardly escape if we pick up a newspaper or turn on television. It is generally taken for granted that these sins and sorrows can be dealt with only by law, or by something we heard little about years ago–counseling. The results of such measures are not always brilliant. My friend Justin Tubbs loaned me this powerful testimony of God’s grace and the cleansing and healing and renewing beauty of the gospel, and I commend it to you. This past Sunday we were privileged to hear a fabulous exposition of Psalm 127 in its canonical context at Kenwood Baptist Church from Jeremy Farmer. This was the first sermon I’ve heard on Psalm 127, and Jeremy did a great job tracing out how this Psalm of Solomon fits with the promise to David and is fulfilled in Jesus. You definitely want to hear this. If you’re like me, you’re eager to know about and support those who are taking the gospel where Christ has not been named, and Jeremy and his family are doing just that. So I commend him to you. Jeremy is a great preacher who understands biblical theology and does a great job articulating God’s big purpose from the perspective of the whole story. Check out their website. They have raised about 60% of the support they need, and they hope to be ready to go to Cambodia by May of 2011. If you want to know how to help them get there, you can visit this page, and you can contact them here. And if you visit our home these days, you’re likely to hear Trip Lee’s 20/20 or Between Two Worlds or Lecrae’s Rebel or Rehab. May the Lord bless this gospel driven art.